The Eagle Rapid Mix is a fast mixing, rugged mixer designed to rapidly mix dry free-flowing materials. The mixers range in capacity from 500 pounds to 63,000 pounds. Material is loaded at the bottom into an intake hopper. 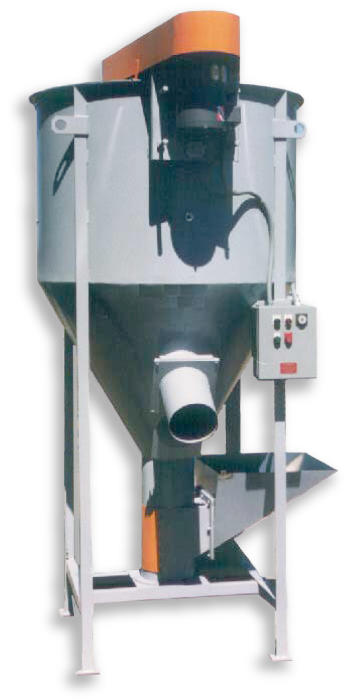 The internal vertical auger and tube mixing system rapidly draws the material upward where it is dispersed at the top by a paddle mixer. 15 525 36” x 36” 28” 31” 8 Ft 480 lbs. 25 875 38” x 38” 36” 31” 8 Ft 658 lbs. 40 1,400 48” x 48” 45” 41” 9 Ft 1,017 lbs. 80 2,800 60” x 60” 55” 41” 11 Ft 1,550 lbs. Download PDF for full specifications.